The move comes amid a currency crisis and spiking inflation. 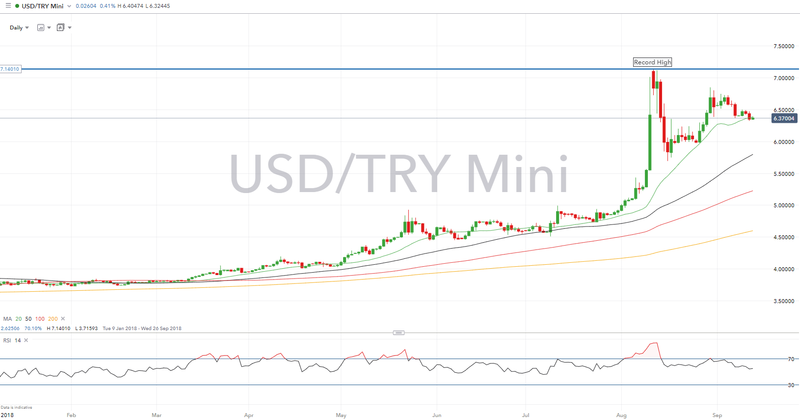 However, the currency pair is still up by over 9 percent since the lira meltdown and almost 40 percent since the start of 2018. Interest rates were increased to 24 percent from 17.75 percent, which is more than double the median of investor predictions of a 3 percent hike. The currency rose to touch 6.3673 per dollar, the highest since 29 August. Just two hours before the central bank's announcement, Erdogan repeated his belief that interest rates should be cut, calling them an "instrument for exploitation". Erdogan said that his "patience" with the bank would have its limits. Signs of movement in the US-China trade stand-off and a bumper interest rate hike in emerging market trouble spot Turkey sent world shares higher today as risk appetite returned. According to the decree, all sales and rental contracts agreed in foreign currency will be converted to Turkish lira. Financial markets have always been concerned about Erdogan's control over monetary policy, which they say has undermined the central bank's ability to fight inflation, now at 18 percent. Turkish economic growth slowed to 5.2 percent year-on-year in the second quarter, data showed on Monday, in what officials described as an economic rebalancing before an expected second-half slowdown as Turkey grapples with a currency crisis. Brunson's detention saw U.S. President Donald Trump impose trade tariffs on Turkey, which triggered August's collapse in the lira. He added that the lira was experiencing "fake volatility", repeating his view that the currency's fall was part of a foreign plot and the result of an economic war. And they say Erdogan remains unpredictable in his policies since he was re-elected this year as president with vastly expanded powers. Erdogan called on Turkey's exporters to take advantage of the current levels in foreign exchange rates to increase the volume of exports, and production and employment as well. The decree also forbade signatories from indexing their transactions to foreign currencies, while ordering existing contracts in other currencies to be switched to the lira by October 12.